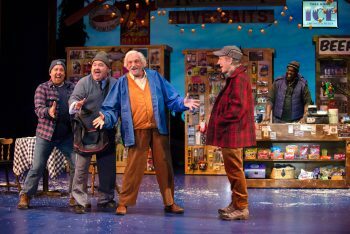 The United States premiere of Grumpy Old Men: The Musical, based on the 1993 movie, is now playing at the Ogunquit Playhouse, and it is a show filled with lively music, funny lines, great scenery, as well as a touching story. In short, this is a play not to be missed. The music written by Neil Berg with lyrics by Nick Meglin is memorable, and Dan Remmes has done an excellent job of adapting the movie for the stage. The story about neighbors John Gustafson (Mark Jacoby) and Max Goldman (Ed Dixon) who have been feuding for fifty years is peppered with one line insults, many of which you might want to jot down for future use. “I’d give you a dirty look, but I see you already have one”, is just one example of the shots these two take at each other. I won’t ruin the fun by giving away the others, but I can assure you they get even better. The two were childhood friends but became enemies when John married Max’s high school sweetheart. Both are now widowers with children of their own. Max has a son, Jacob (Kevin Massey) and John has a daughter, Melanie (Laura Woyasz). Mr. Jacoby and Mr. Goldman are well paired in their roles as Gustafson and Goldman. These two really know their way around the stage and exchange their lines with perfect timing. They also convey how underneath all of the animosity there is still a bond between the old curmudgeons. I very much doubt that two people who hate each other as much as John and Max would have us believe they do could put so much feeling and energy into their insults. The opening number Wabasha introduces us to the town and people of Wabasha, Minnesota where ice fishing is a popular pastime. There is the upbeat owner of the general store Chuck Barrels (Doug Eskew) the accident prone Harry (Blake Hammond) the mailman, and the ditzy but very lovable Punky Olander played by Ogunquit Playhouse favorite Sally Struthers. 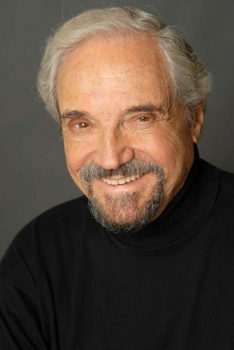 Hal Linden plays Grandpa Gustafson. On the number Way To Go, John, Max, Chuck, and Grandpa are ice fishing and we begin to see the direction the story will take as the four reflect on life. Do we stay stuck with our regrets or do we move forward and live? Mr. Linden brings a depth to this song that will have you taking stock of your own life. Ultimately, it is all about choices, and sometimes people don’t realize they have choices until something or someone comes along to open their eyes. In this case that someone is Ariel Truax (Leslie Stevens), a college professor who has inherited a house in Wabasha. Ariel arrives on the scene riding a snow-mobile with her red hair blowing in the wind singing Heat Wave. This heatwave puts Max and John back into the love rivalry business as they both vie for her attention. Ariel likes to drop quotes from classic authors but she is no highbrow. She is a caring and insightful person, and Ms Stevens gives her character the depth that she deserves. is solid from top to bottom. Tony nominee Brenda Braxton plays Sandra Snyder an IRS agent who has come to Wabasha in pursuit of unpaid taxes owed by John Gustafson. In Snyder Comes Along we see just how much she relishes her work. You wouldn’t want Ms Braxton showing up at your door to conduct an audit, but you will certainly enjoy watching her perform on the stage. There is a touch of the devil in her, but also a twinkle in her eye. I loved the music in this production. Doug Askew’s Chuck touched everyone with Angel. His voiced filled the theater with warmth and richness. It is a powerful number well done. Our Friend Is Gone sung by the ensemble is sad but also reminds us to appreciate the blessing of friendship. Jacob and Melanie sing Parents and Paradise, a song that deals with their life choices and with the difficulty when those choices conflict with caring for parents. 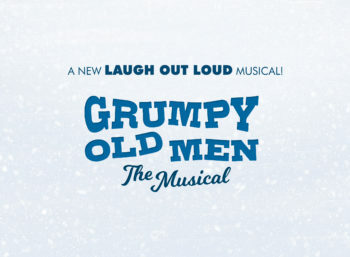 Grumpy Old Men: The Musical has so much going for it. It is a pleasure to watch the strong cast perform. Sally Struthers’s role has Punky could have been written just for her. Her non-sequiturs are very funny and when she breaks into faux Swedish along with yodeling, well you just have to see her. Hal Linden, best known for playing Barney Miller on TV, has also had a long career in music and on stage. He brings that experience to the Playhouse stage and it is a pleasure to watch such a master at work. When he says the line “Life is all about livin’” he is proof of it. Mr. Linden has amazing stage presence. You don’t want to miss him. This musical really works. The book is great, the score is outstanding, the cast is solid from top to bottom. Every song is good and filled with meaning. It’s a feel good play that doesn’t get hokey. It’s also a play about choices, about how we can do that “livin’” Grandpa Gustafson is talking about, and age should not get in the way. I would be very surprised if this production does not move on to Broadway. I recommend you see it now at the Ogunquit Playhouse while you have the chance, you won’t be disappointed. As I have said, this play is about choices, and you have a choice; Head to the Ogunquit Playhouse and have a memorable evening or stay home and miss out on some very good theatre. 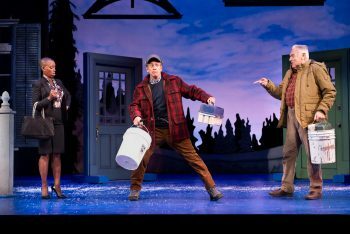 I highly recommend Grumpy Old Men: The Musical. Fasten your seat belt, it’s going to be a grumpy ride! 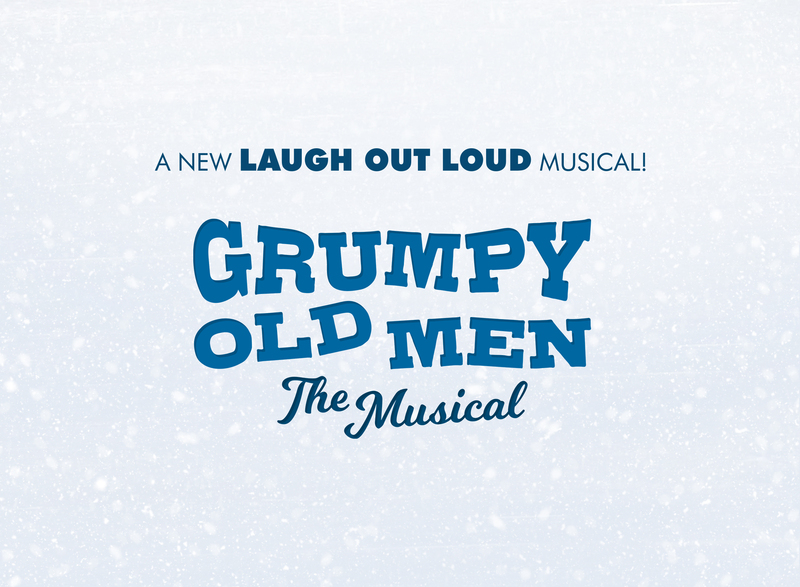 The Ogunquit Playhouse is proud to produce the U.S. premiere of the new musical-comedy, Grumpy Old Men the Musical on stage from August 8 to September 1 — just in time to celebrate the 25th Anniversary of the hit film that starred Jack Lemmon, Walter Matthau and Ann-Margret. This hilarious new show was penned by Dan Remmes, with music by Neil Berg and lyrics by Nick Meglin. Director for the Ogunquit production of Grumpy Old Men the Musical is Matt Lenz. which premiered in the fall of 2016, and recently guest starred in the acclaimed IFC comedy series Maron. 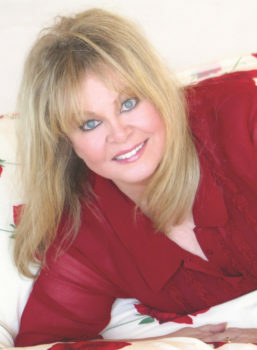 Sally Struthers has performed many roles at the Ogunquit Playhouse including last season’s Bullets Over Broadway as Eden Brent, as Evangeline Harcourt in Anything Goes, the Duchess Estonia Dulworth in Nice Work If You Can Get It, Mama Morton in Chicago, Paulette in Legally Blonde and as Felicia Gabriel in The Witches of Eastwick.